As already reported elsewhere, the introduction of Enviro400 33423 SN60CAA into X1 service has allowed for the beginning of the repaint of X1 Geminis into the new First livery. Grahame also saw all three of Sanders recently acquired Wright bodied Scania L94UBs from Reading. Finally, with the regular open top bus G520VBB being unavailable, Coach Services' former London Transport Routemaster RM2151 CUV151C was being employed on the Norwich Sightseeing service. As mentioned previously 541 is being used with Bournemouth Trolleybus 202 to mark the 50th anniversary of the National Trolleybus Association. I was recently looking through some old photo albums of mine when I came across some pics of buses/coaches that used to operate in the Great Yarmouth area. Rather than keep them to myself, I thought I would share them with you with the hope that I might stir some memories and receive some comments. So that is how the new occasional 'Down Memory Lane' series was born! I can remember many of this operator's coaches laying over at Beach Coach Station during their daily summer service to Great Yarmouth in the early 1960s. At the time, I was still at school and was lucky to have a Brownie 127 camera as a birthday present. With film being quite expensive (I only had half a crown a week pocket money!) I was limited to the amount of photos I could take. I would be interested to receive readers' thoughts on this article and the feature in general - apologies to our younger readers who may wonder what all the fuss is about!! One of the regular operators to visit Great Yarmouth during the summer months is Luton based Three Star Coaches. Sponsored by Anglianbus, the Gala begins at 1:00pm on Saturday with after dark running until 9:00pm. Sunday opening times are 10:30am to 5:00pm. Worthing Rotary Carnival has been an annual August Bank Holiday fixture in the town since the 1920s and is the flagship event for the three Rotary Clubs of Worthing, Worthing Steyne and West Worthing. Some eighty vehicles took part in the East Coast Truckers event held annually on every Sunday of the August Bank Holiday weekend. The charity run takes children with special needs to Pleasurewood Hills and Great Yarmouth for the day. However, on a tip off from blog contributor Tim Miller, I was advised that she was working the 12:25 Beccles to Great Yarmouth 581 service today. Operating between Thorpe Market, The Green and Suffield Park, Mill Road given service number 59 effective from 01-Sep-2013. Operating between Ridlington Church and Stalham Middle School given service number 707 effective from 01-Sep-2013. She had no power steering, so it was left to ASW Recovery Services Breakdown Lorry - M357HMS - to pick-her up at around 7.30 last tonight. Unfortunately,due to family commitments, I missed 33423's appearance by around five minutes. The Norfolk representatives were D & H Harrod's Volvo B10M N12DHH and Sunbeam Coaches of Norwich Mercedes Benz O814D YX54BHF - formerly with Brownes of West Ruislip. TransLinc Scania K114IB4/ Van Hool Alizee TC03TLC was hiding on the back row of the assembled coaches. She was accompanied on the 3A by recently acquired Wright Eclipse Gemini bodied Volvo B9TL 37562 FJ08FYN. 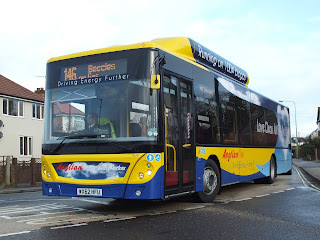 As previously referred to in earlier posts, from 2nd September 2013 Anglianbus will be introducing a new bus network across Norfolk and Suffolk. There will be new service numbers and new routes, additional journeys and a new more direct Great Yarmouth to Norwich express service. Journey times have been revised to improve punctuality and reliability. "We believe the changes will benefit the majority of our passengers and provide more reliable services and I’m confident that the new anglianbus Network will help us attract more people onto our buses. We’re particularly excited about our new more direct Norwich to Great Yarmouth service 7, our through service from Norwich to Southwold 88/88A, and a bus every 20 minutes between Kessingland and Yarmouth on the 61. We are pleased too to be able for the first time to provide a service to Whitton Estate (the 60) in Lowestoft following many requests". New service mainly every 20 minutes via Whitton Estate and Bentley Drive. Norwich to Beccles withdrawn. Minor changes to integrate with new 60. Essentially every 2 hours running through onto 61 at Kessingland from/to Yarmouth. Rerouted in Halesworth via Harrisons Lane to avoid low bridge. Revised timetable incorporating BH002 School journeys. Revised timetable to improve timekeeping and rail connections with later bus to/from Diss and new facilities for Bungay Sixth Form College. Revised timetable to improve timekeeping and extra journey at 18:10 from Yarmouth to Beccles. 14:45 Hemsby to Great Yarmouth withdrawn. Every 20 mins Kessingland to Great Yarmouth with hourly extensions to Southwold. Extra early morning buses. With service 60 provides 6 buses per hour between Pleasurewood Hills and Lowestoft Rail Station. Sunday service extended from/to Great Yarmouth with connections to Norwich. New service mainly every 20 minutes via Bentley Drive. Essentially every 2 hours running through onto 61 at Kessingland from/to Lowestoft/Yarmouth. Rerouted in Halesworth via Harrisons Lane to avoid low bridge. New direct express service between Great Yarmouth and Norwich. Peak journeys extended from/to Gorleston. Still operates via Yarmouth Road for Broadland Business Park and Norwich Station. Acle covered by 52. Revised timetable. Includes BH002 school journeys. Change to route and timetable to allow use of larger vehicles, as a result, Kemps Lane and Pleasant Place will no longer be served. The new network will be contained in 6 handy timetable leaflets with a brand new website for anglianbus being launched from 26th August. Optare Tempo YJ55BLX has transferred to Konect and is soon to go to Full Circle for a repaint into their livery. It was only last week that I photographed her operating on the 601 service between Great Yarmouth and Kessingland. The Caetano Optimo bodied Toyoto Coaster BIG7756 was new to Translinc of Lincolnshire in 1998 as their S32FFW and Reynolds acquired her in February 2011. The second vehicle advertised for sale is Reynolds' 1994 Dennis Javelin in the shape of BIG9836. The Plaxton Premier bodied 57 seater was delivered as M606WTW to Ferrers of South Woodham Ferrers in November of that year. Belle Coaches have been operating continuously in the Lowestoft area since the early 1920's. Mr Benjamin Robert Shreeve started the business in partnership with Mr Charles Day running a bus service between Lowestoft and Oulton Broad using 14 seater Model T Ford charabancs. The partnership was later dissolved with Mr Shreeve forming his own company. By the 1950's, Mr Shreeve's three sons, including John, were all working in the business which enjoyed rapid expansion following local operator acquisitions. In 1959 a Saxmundham company was purchased and, soon after, a new operating base was established at Leiston under the control of John Shreeve. This was primarily to serve the United States Air Force bases at Bentwaters and Woodbridge. One of the highlights was the appearance of an Ipswich Buses Scania N94UD double decker on an excursion. Also of interest was Freestones of Beetley's Joncheere bodied Volvo GDZ571. New Undertaking: Limousines and novelty type vehicles are not to be operated under this operator’s licence.. Attached to Licence. New Undertaking: Vehicles with eight passenger seats or less will not be operated under the licence without the prior written agreement of the traffic commissioner who may require you to agree to certain undertakings.. Attached to Licence. Registered Bus Services running under this licence have also been surrendered with immediate effect. Operating between Lowestoft Bus Station and Beccles, Old Market given service number X22 effective from 15-Sep-2013. To amend Route, Stopping Places and Timetable. Operating between Wymondham and Wroxham/ Blofield Heath/ Lingwood given service number 14/14A/15/15A effective from 22-Sep-2013. To amend Timetable. Operating between Lowestoft Bus Station and Lowestoft Bus Station given service number 103 effective from 15-Sep-2013. To amend Timetable. Regular contributor Rob Collins visited the tourist area of Great Yarmouth yesterday. Clarkes was first established in 1958 and at the time traded predominantly as a small time haulier transporting coal within South East London area. Initially providing the odd trip to the seaside for the local children, the business soon developed into providing coaches for local schools and clubs. 'When my wife and I got married we had a Metrobus as a wedding car - KYO622X. It was still in London red and was lent to us when I worked at Norfolk Green. However I have no knowledge of whether she is still running or gone to the bus garage in the sky. I am therefore asking if any blog readers are aware of KYO622X's existence and also of any subsequent history since her disposal by Norfolk Green. Optare Excel W216PRB was first noted in the yard being prepared for a repaint during the middle of last week and emerged from the paintshop earlier this morning. However, W216PRB still retains part of its Konectbus identity, featuring the Konectbus web address at the top of the rear windscreen!